Should we legalize marijuana? If we legalize, what in particular should be legal? Just possessing marijuana and growing your own? Selling and advertising? If selling becomes legal, who gets to sell? Corporations? Co-ops? The government? What regulations should apply? How high should taxes be? Different forms of legalization could bring very different results.This second edition of Marijuana Legalization: What Everyone Needs to Know® discusses what is happening with marijuana policy, describing both the risks and the benefits of using marijuana, without taking sides in the legalization debate. 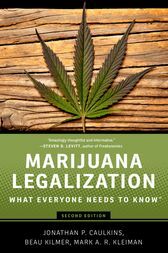 The book details the potential gains and losses from legalization, explores the "middle ground" options between prohibition and commercialized production, and considers the likely impacts of legal marijuana on occasional users, daily users, patients, parents, and employers - and even on drug traffickers. Jonathan P. Caulkins is H. Guyford Stever Professor of Operations Research and Public Policy at Carnegie Mellon University's Heinz College of Public Policy and Information Systems Management. He specializes in systems analysis of problems pertaining to drugs, crime, terror, violence, and prevention - work that won the David Kershaw Award from the Association of Public Policy Analysis and Management, a Robert Wood Johnson Health Investigator Award, and the INFORMS President's Award.Beau Kilmer is a senior policy researcher at the RAND Corporation, where he codirects the RAND Drug Policy Research Center. His research has appeared in leading journals and his commentaries about marijuana have been published by CNN, Los Angeles Times, New York Times, Newsweek, San Francisco Chronicle, Wall Street Journal, USA Today, and other outlets.Mark A.R. Kleiman is a Professor of Public Policy and the Director of the Crime Reduction and Justice Initiative at New York University's Marron Institute of Urban Management. He is a member of the Committee on Law and Justice of the National Research Council, and is a frequent guest expert in the media. He is the author of five books on drug and criminal justice policy.